Under INSPIRE Award MANAK scheme, in a financial year, ten (10.0) lakh ideas are being targeted from more than five (05) lakh middle and high schools across the country, out of which one (1.0) lakh ideas are to be shortlisted for an initial award of Rs. 10000/- each, for preparation of project/model/showcasing of idea and participation in the District Level Exhibition & Project Competition (DLEPC). The students who are eligible to participate under this scheme should be in the age group of 10-15 years studying in class VI to X. The award money under this scheme is being transferred directly into the bank accounts of the students through Direct Benefit Transfer. The selected students in DLEPCs participate at State Level Exhibitions and winners of State Level Exhibitions further participate in the National Level Exhibition organized every year. The participants of the National Level Exhibition are also provided mentorship for prototype development in association with reputed science and technological institutions of the country. All middle and high schools of the country whether Government, private, semi-private, aided, un-aided are eligible to nominate 2-3 students from their schools, during a financial year, along with all the details including a brief write-up of the idea of the student. 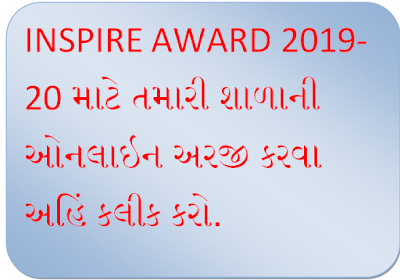 The short listing of students for INSPIRE award MANAK and mentoring will be provided by National Innovation Foundation (NIF), Ahemdabad, a autonomous organization of DST, based on the idea submitted by the student.